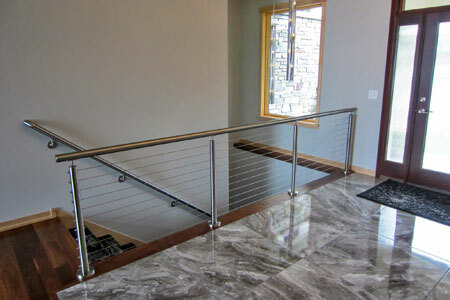 The Brushed Finish, Subtle Curves and Bold Lines of our Round Stainless Steel Cable Railing Systems give them Modern Eye Appeal, and Class, that exceed anything on the market today. Like a cool swimming pool in the middle of summer, this crisp, contemporary interior is beautifully refreshing, tinged in the honey glow of warm woods. 3 Things to Decide FIRST: Anticipated Rail Height - Usually 36" or 42" Top (Deck) Mounted or Side (Fascia) Mounted Posts Our 2" OD Stainless Steel Top Rail (Matches our Posts) or your Own (Can Match your Decking) Building our Round Stainless Steel Cable Railing Systems consists of the following 5 Steps.